Some weeks ago, I went to a circus with my family. It promised to be an interesting experience so we all looked forward to a fun evening. By the time we got there, a few animal right activists were already stationed around the parking lots with placards that denounced ill treatment of animals. I wasn't bothered by that, really, because I’m not wired that way. Anyway, we took our seats and after we settled down, one of us went to get popcorn and drinks for the rest of us. One thing was certain, we couldn't wait for the show to start and we were not the only ones. The mood in that large tent was anticipatory as all around us, people settled in. There was a huge elephant on the stage, giving rides to kids and my adventurous Nwando wasn't to be left out. She asked if she could go on a ride and was thrilled when she got a ‘yes’. Off she went with her cousin while the Mister tagged along as the paparazzo. It was wonderful seeing her on that elephant but it also looked strange to see that huge animal walking slowly around the stage with a few people at a time on its back. There was something almost pathetic about that. That elephant looked completely out of place in that scenario. I thought at the time that it would have looked better in a herd in a forest. I could also picture it as a part of a herd standing around some muddy water. In my imagination, in order to get cooler, it was pouring that water all over its body with its massive trunk. Somehow, as it walked around that brightly lit stage, I was waiting to see it throw back its head and to hear that trumpet that screamed ‘elephant’ erupt from its trunk…. Nothing... Absolute silence from it... except if you count those sounds that they make that are very low in pitch, which humans cannot hear. Anyway, soon Nwando was done with her ride and she was still on a high when she came back to sit beside me. The show started with a lot of pomp and gaiety. We all stomped our feet and cheered loudly as each colourful group of performers came on the stage and took a bow. It was very exciting, really, seeing them dressed so gaily and obviously full of energy. It was as if they couldn't wait to perform. Soon, the lights went off and only the stage was lit. The show had finally begun. One after another, each group mesmerized the audience. I couldn't fault their performance in any way. At a point, though, a young man on a horse, which was racing around the ring, almost slipped and fell but he held on till his show was over and got lots of cheers and clapping for his effort. At some point, during an interlude, metal bars that were really high were erected around the ring. I knew then that it had to be big cats coming on. I couldn't wait to see which cats those would be. Soon, cages were wheeled into the tent. There were these magnificent-looking tigers in them. The animals had a handler and he went into the ring first. The cages had a connection to each other and were placed in a straight line so that when each demarcating bars were raised, they had a long runway to walk through and they exited the now-single cage. Those animals performed other tricks that got the audience ‘oohing’ and ‘aahing’ while they made me even more reflective. At some point during the show, Nwando looked at me and asked, “Mummy, why are you sad?” I told her that I wasn't sad and I was only thinking about something. Really, I was. I am no animal activist so it wasn't so much about the animals being caged and being made to do stuff that were not natural to them, just to entertain humans. I was sad that some of them might have been born in captivity and so didn't know what freedom or being in the wild meant. I was actually glad to see those cages because it meant that regardless of their circumstances, they were still wild. I was glad to see that thing that made them tigers acknowledged. What really got me was comparing us and them and coming to the realization that, in so many ways, most of us are caged. Just like that handler wielded his whip and tapped any tiger that was messing up its routine, so do we have different masters cajoling, seducing and, if all that sweet-talking fails, whipping us into line. We often forget who we are and what we have inside of us, when those masters trap us in a cage and make us perform to their wishes. We forget that just as the tiger never loses its stripes, so do we not stop being the image of Who we are. We forget that those metal bars are there because our masters know that without them, we are free and that despite them, we are who we are. You don’t stop being an image of God just because you are held captive by some bad habit; or if we want to call a spade a spade, by some sin. You may have been born into whatever it is that holds you captive, so you truly don’t know better. You may never have tasted what freedom means. But, that doesn't change the fact that you have the authority God gave you the day He made you. You might be ignorant of it but your handler isn't That is why he has that cage around you so you never find out what power you have inside of you. Like the elephants that communicate secretly with each other through infrasound that humans cannot hear, so are you. With that form of communication, they signal to each other and they avert danger. At that point when that huge elephant was giving rides and I was waiting for it to let out a trumpet, it may have been making distress calls that we couldn't hear. If there was any elephant close enough to hear, it would have avoided that circus because it would have known immediately it heard those sounds that the circus was a place of captivity. Anyone may have laughed at that elephant for not showing its power, without knowing that, just maybe, it has saved a whole herd. Who can you reach out to today? Remember that no one has to know you're talking to them. Who can you let your experiences teach? Are you going to let them be in vain, those tears you shed? Would you just accept that those cages are there to stay and you can do nothing about them? Would you remain in a ring with your handler, who’s only using you? You are more powerful than he is, remember? He knows that. That’s why he’s caged you and hopes, fervently that you never find out who you really are. Don’t let that roar not come out you, just because you have been taught not to even squeak. When you reach inside of you, draw upon the strength you have and you will find that it’ll be enough to bring forth a roar. Don’t spend your life performing tricks in a ring, for the entertainment of people who don’t care a hoot about you. The tigers don’t have a choice in the matter till they decide that they do. They may never decide because at the end of the day, they are only animals. That’s where we are different. The fact that we're made in the image of God alone gives us the power to live like He would have us do. It’s our individual choices how we decide to live. 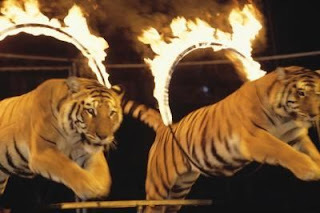 When the show with the tigers was over, their cage was opened once more and they started filing out of the ring and into it. One tiger refused to leave the stool it was on. The handler pointed at the door of the cage but it still refused. That may well have been part of the show but I was thrilled by that show of defiance. It told me that if a tiger can defy its whip-wielding master, so can I defy anything at all that I have allowed to be master over me. At that point, though, the handler raised his whip and it came down on the tiger as he yelled, “Go home!” The tiger got off the stool and walked oh-so-majestically into that cage, taking all that power back into that tiny cage. Still a tiger after all... that’s where we’re different. Wow! wow! Speechless. Still sober-reflecting. I actually practiced a little "roar" while reading this. Of course, I'm no lion but I'm reminded of my Source and what power I wield. Wonderful piece, my dear. Sooo true! These words I'm sure will encourage someone somewhere. Wow my dear!indeed a good writer emerges,ur mode of writing always reminds me of chimamanda Adichie.u r good.d story so mind reflecting and soo true!many of us r so caged! A society were self imposed imprisoment is the order of the day,this golden thought will serve as a constant reminder that we all have the keys to our cuffs. Awwww.... thought provoking! i'm actually challenged. good one....thanks for sharing this. u're a blessing! Awesomely inspiring! U r a Gd‎​ writer Ola. ° • · ♥·♡ ΤНÄИΚ$♥·♡ · • °. For sharing. Really great writing Ola. I love the way you use real life experiences to pass your message. Really sobering thought. We can let our own shackles down, we can overcome our weaknesses if we damn well try. It's all about being willing to bring out that power that we have , already invested in us by our creator. No one should stop us. Not even a Whip wielding master. My sister thanks for reminding me that even if Iam down, I should not allow myself to be out. My own golden thought to my fellow women is that each day they should encourage, empower and conquer themselves and one another. Weldone sister. Somayina; Roar on darling. The daughter of a Lion is a lioness. Anon 21:51; Thank you! If one person alone is encouraged, the One who inspired intended it for just that person. Anon 08:57; Thank you! High praise, indeed. Yeah, most of us are caged in one way or the other. Ella; You summed it up perfectly, dear.. Thanks, sweetie. Brick's Momma; Not even a whip wielding master, girl! Not even that. Thanks, darling. Evvy; You're welcome :) Thanks for your comment. Oh my, what a day, Bola thought as she drove home. I need to see my children before they go to bed. Can you all just move out of my way so that I see my babies before they sleep? Shoulders slumped, she sighed sadly. Traffic on the bridge was very heavy and she was yet to get to the middle of the bridge. The clock on her dashboard read 8:30. She realized that this night, she was surely not going to be home in time for her children's bedtime. They had been asleep when she left home this morning too. She truly was fed up neither seeing her children often nor spending quality time with her husband but she didn't know what she could do about that. I can't resign from my job just yet, Bola thought, miserably. I haven't saved enough money to start a business with and to maintain the lifestyle we're used to, we do need the income that comes in from my job. I just don't like knowing that my family suffers as a result. A few mornings ago, I heard a sound alert on my phone that indicated that I had an email but I ignored it. After a while, I heard another alert, indicating that another email had just come in so I picked my phone and saw that the emails were notifications of comments on two articles on this blog. One of them was by an anonymous person and I already suspected what it would be. I was right. The anonymous comment was a spam comment, one of which I've been getting somewhat frequently, lately. Usually, links leading to phishing sites are embedded in them. Luckily, blogger recognizes them and moves them to the spam folder. Unfortunately, other times, anonymous comments that are 'clean' get moved to the same folder and I would have to move them out of that folder before they can appear on the post. © Golden thoughts, 2017. Unauthorized use and/or duplication of any material on this blog, without express and written permission from this blog’s author and owner, is strictly prohibited. Excerpts and links may be used, provided that full and clear credit is given to Golden thoughts, with appropriate and specific direction to the original content.